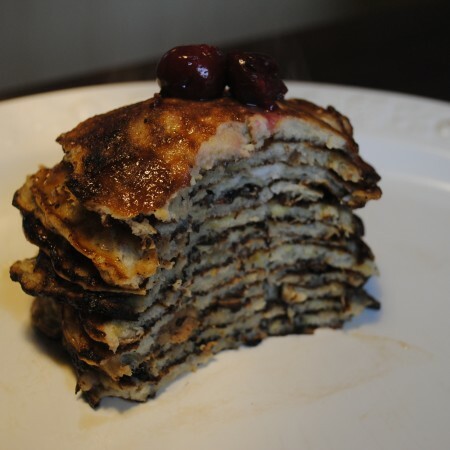 Start your day off right with these easy and healthy 3 Ingredient Pancakes. Soft, fluffy with the added bonus of being gluten free! 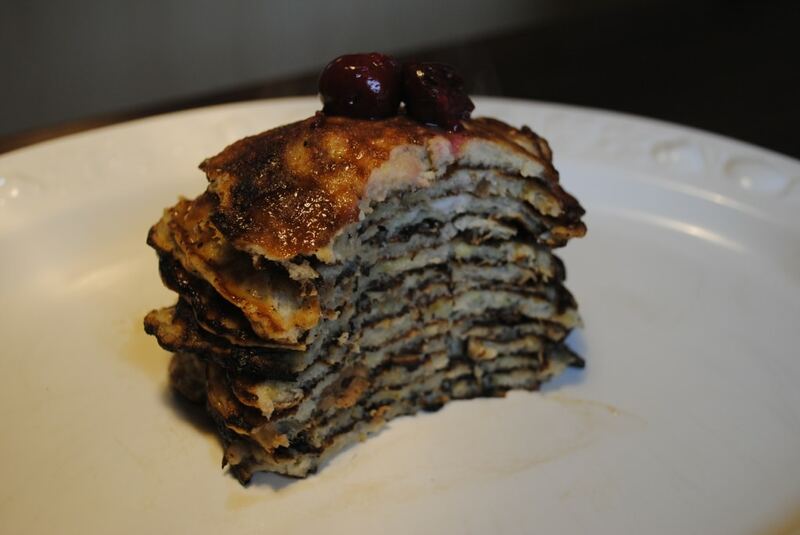 We love pancakes in our house, and we would love to have them every day for breakfast if we could. I mean, we could, but it is good to have variety. With that being said, when we do eat them, we want them to be as healthy as possible. I am not against carbs, not at all, but if I can make something flourless and it still tastes great, then that is what I am going to do. 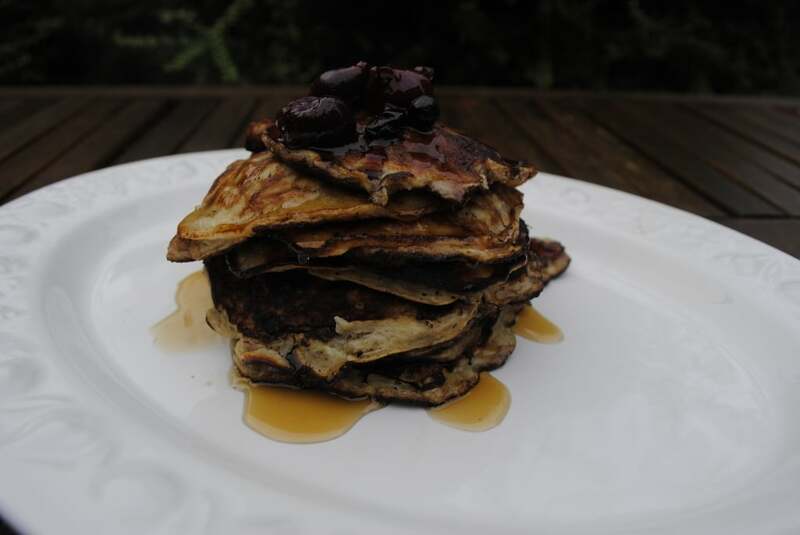 I have been experimenting with pancakes for a few weeks now, and after my VERY disastrous attempt a couple of weeks ago at an egg white pancake, in which my husband could only eat one bite (and he will eat almost anything), I am really pleased to have finally done it, and it is so simple. It actually tastes more like dessert. A breakfast that tastes like dessert and is good for you? If you are not convinced already, just look at how easy it is to make. Well, I say it is easy. It is easy in the sense that there are very few ingredients and little effort is needed, but it is not easy in the sense that it is frustrating to keep them together (that is where the flour comes in handy). The frustration comes from the temptation to make a regular size pancake, but because there is no flour in these, they need to be made much smaller. 2-3 tbsp of batter per pancake works well. Just serve yourself a few mini ones, rather than one large one. They have to be small as the consistency means they are hard to flip. Don’t be put off by that disclaimer though, there are still pretty easy. You can also make a big batch of these and freeze them, so you have a healthy breakfast already made for you. Oh, and they are not burnt in the photo, they just got “extra crispy” when cooking. *EDIT* One of the Hungry Healthy Happy Facebook followers, Christine, said that this batter works great for waffles too, so give that a go too. Mash the bananas until smooth and vanilla and baking powder. Add the eggs and almond butter and mix until a "batter" forms. Heat some butter/spray oil in a pan and once hot, add spoonfuls of the batter to make pancakes around 3inch/7.5cm in diameter. Cook for around 2 minutes (may need a little longer if still runny) and then flip and cook the other side. Serve with toppings of choice (I went with cherries and maple syrup). Hey Dannii, I just made these pancakes and they were so tasty! I added some cinnamon (I add cinnamon to pretty much everything) and some ground flax and chia seed. Delicious! Thanks for the recipe. I like Nicole wonder….your recipes say in the calories….per person. How many servings your recipes make so what would per person actually break down to??? I am an avid calorie counter and can not really try all of your recipes and that depresses me because they look so good….but if I can’t define a serving, I can not eat it. I am down 215lbs and calorie counting is what got me here and I know it is what will help me maintain. Thank you! All the information you need is already there in the recipe. Next to ingredients, it says serves 4. So one serving would be a quarter of what the recipe makes 🙂 All my recipes always say how many people the whole recipes serves. Love your blog, and I follow you on all social media!! Please keep up the awesome work!!! I see that they are calories a serving. How many pancakes are in a serving for one person? Thank you. Next to ingredients, it says serves 4. So one serving would be a quarter of what the recipe makes 🙂 All my recipes always say how many servings it is. The amount of pancakes depends on how big of small you make them. Do you think this would make them stick together better? I was just wondering. I have never used it, but other sites I have looked at are using this in their baking. It might work, but I find they stick together fine, if you make them small enough. Can you make them without the nut butter? I am alergic to nuts. Also i see a lot of other recepies use greek yogart anything else for that my husband cant do dairy? You don’t have to add nut butter – you can leave it out totally, or make a seed butter instead. Just finished eating it and it’s amazing! I bought cashew natural spread with 100% cashews and I am in love with it! I am never going back to processed oily peanut butter… I added some of this on top of my pancake cos I added about a teaspoon to the batter but it was soooo yummy! Sooo filling! I made one for myself so I used a small banana, an egg, a bit less than a teaspoon of nut butter and it has worked out fantastically! Thank you! Instead of eggs can I use egg whites? I hate egg yolks! hi these looks yum BUT i am not able to use almond butter will any other butter work well ? Yes, any nut/seed butter will work. Pancakes are probably my all time favorite food, and my daughter’s too. I always try to make them as healthy as I can, too, so I will definitely have to give these a try! Let me know how they go. Have had quite a few people say that their kids loved them!